The annual Service of Light was celebrated at Blackrock Road on Wednesday, 12 December 2012. 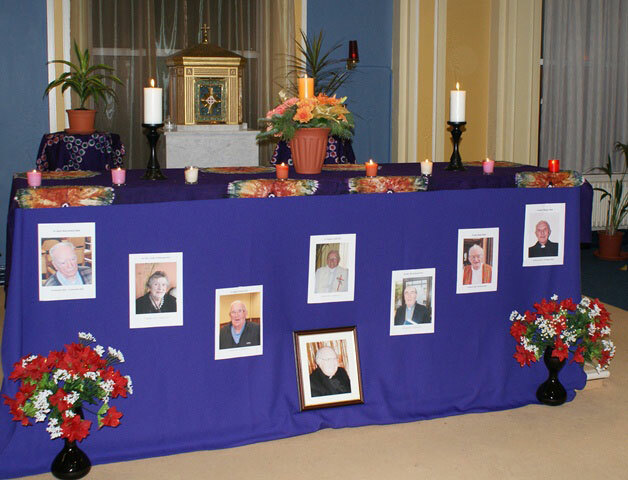 In the past twelve months one brother and five priests have gone to their eternal reward as well as two Honorary members and Canon Denis O’Leary [of Cork & Ross diocese] who spent several months in St Theresa’s Nursing Unit prior to his death in August. All nine were remembered at the Service which was led by the community Leader, Fr Colum O’Shea. In welcoming everyone to the Service, Fr Colum paid tribute to the dedicated nursing and other staff in St Theresa’s. “We are very lucky to have such caring staff for our elderly and infirm members”, he said. He then invited some of the staff and community to light the individual candles in memory of the deceased. After that we listened to brief ‘In Memory’ presentations g iven by different people. Sr Rosalie Bowles OLA spoke about Sadie McDonagh, who had served this SMA community for most of her life. Sadie was ‘dedicated to God and spoke to God as she would speak to any of us. A woman of simple faith.’ Sadie had an impish sense of humour and her favourite pastime, going around the shops, was always completed by a cup of tea in one of the local cafes. Billy O’Sullivan spoke about his classmate, Fr Paddy Whelan. Paddy saw the value of sport as an important aspect of the overall education of young people in Ondo diocese where he worked for many years, in different schools and colleges. Referring to the Emmaus story, Fr Billy reminded us of those important words of the disciples to Jesus: ‘stay with us, Lord, the day is nearly ended’. It is good for us to call on the Lord to stay with us, especially as we approach the latter stages of our life here on earth. 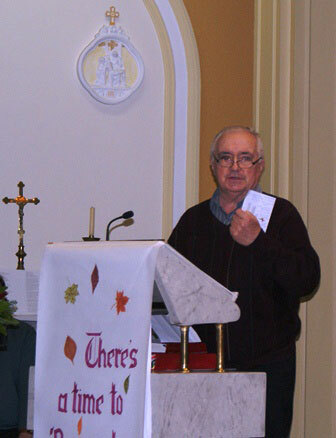 Brother Jim Redmond was remembered by Denis Collins, who had lived with Jim in Wilton for many years. The man that Denis met in Ibadan in 1964 was a soft spoken, pleasant and unassuming man. When Denis came to live in Wilton in 2004, and renewed acquaintance with Br Jim, “I was able to confirm that my first impression of him formed in Ibadan was indeed true.” Br Jim left a wonderful legacy in Wilton – in the Promotions Office, as Organist for parish and SMA events and, most significantly, the founder of the Junior Choir for the young people. “So many people I’ve met are proud of the fact that they had been in the Youth Group and in Br Jim’s choir.” He was also a dedicated family man and also spent a lot of time working for Edel House in Cork City. Tim Carroll spoke about a fellow ‘Ilorin man’: Fr Der Healy, a proud Kerryman. Tim remembered Der as a committed educationalist and, in later years, a pastoral man. He was a good singer but also “a great story-teller, a seanachai, in the best Kerry tradition.” Christ too was a great storyteller, the seanachai of the Bible. “So in heaven, Der the story-teller, is in good company.” Der was a man to whom many SMAs and others went for advice. 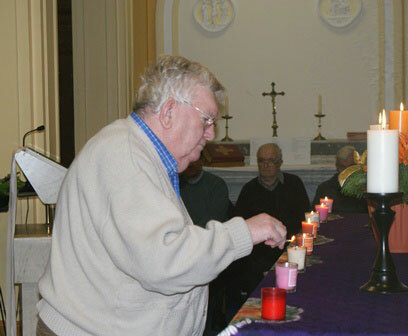 Our picture shows Fr Sean Lynch lighting Der’s ‘memorial candle’ at the start of the Service. The oldest man in the Province, Fr Bob O’Regan, who died aged 97 years was fondly recalled by Michael Brady [pictured left]. He remembers the words of advice Bob gave him when he and the late Fr Michael Walker first arrived in the MidWest of Nigeria: “Respect the people. Treat everyone with respect.” Bob was a man of dedication and goodness and was highly thought of by the people in the different areas where he worked, particularly in Warri. “He was a man of compassion and love for the African people”. Fr Finbarr Crowley PP spoke about Canon Denis O’Leary. Both of them, as well as Fr Robert Brophy who also attended the Service, were members of the Cork & Ross Mission to Peru. Finbarr had lived with Denis in Peru and one of his abiding memories of him was that he always sought to make time to greet the local priests and spend time with them. Denis saw education as the key to progress for the people and he worked unstintingly to find out new ways of advancing the people’s education and skills. Whilst not the greatest of timekeepers, Denis was dedicated to the service of others. He was also deeply committed to his own family and never missed an opportunity to spend time with them. Because of his gentle nature, Denis was non-threatening to others and so they sought him out when in need. Fr Colum O’Shea spoke of the late Mrs Ellen Galvin, an SMA Honorary member, who was deeply involved with the Society through the Family Vocations Crusade in Connacht. Mrs Galvin helped with the development of the SMA in Zambia. You answered to their call. Der, light a candle for us all. Amen.